I had never heard of Colonel John W. Ripley before recently, when he passed away at the age of 69. John Ripley was an American hero, a US Marine, whose daring exploits will be forever extolled at the military academies of our great nation, and wherever American soldiers learn their trade. Colonel Ripley’s story seems more like the stuff of nail-biting war movies, than real combat. In 1972 he single-handedly stopped an enemy offensive during the Vietnam War, by blowing up a critical bridge on the major highway between North and South Vietnam, an action that is memorialized at the US Naval Academy by a diorama, a three dimensional model depicting the bridge and the surrounding landscape. As a Captain serving as Senior Advisor to the 3rd Vietnamese Marine Battalion at the Dong Ha bridge that spanned the Cua Viet River, he received the sobering order to “hold and die” against an onslaught of over 20,000 enemy troops and 200 tanks, poised on the other side of the river to cross the bridge and move down into Quang Tri province. 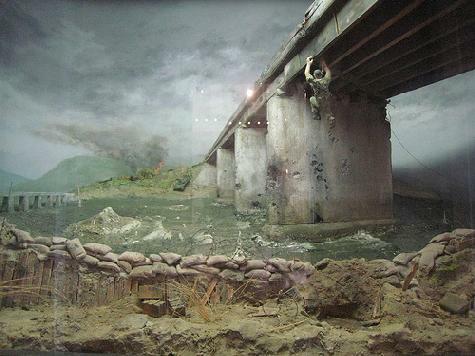 For three hours, on Easter Sunday, April 2, 1972, under constant threat of enemy fire, Captain Ripley swung hand over hand beneath the bridge, placing high explosive charges at first one side and then the other in a diagonal fashion, that when detonated, would cause the bridge to literally twist itself apart and fall piecemeal into the river below; biting on explosive blasting caps as he went, that could rip his head apart, one by one he affixed a cap to each charge. On that day, I was aboard the USS. Oklahoma City (CLG-5), a light guided missile cruiser preparing to get underway for the Gulf of Tonkin, having received in rapid succession news of the new offensive, and orders to leave port on April 1. It took two days to cancel all leaves and all work in progress, refuel, and leave Yokosuka, Japan, and when we arrived in the Vietnam theater on April 5, all hell had literally broken loose. One lone Navy ship had been on station in the area at the time, and we quickly joined up with her to provide naval gunfire support to the South Vietnamese troops at Dong Ha. For exceptionally meritorious service from 5 April to 4 December 1972 while participating in combat operations in Southeast Asia. Operating in an intense combat environment, USS OKLAHOMA CITY demonstrated the highest level of combat readiness and proficiency while providing close naval gunfire support for Republic of Vietnam forces in Military Region One and in the conduct of naval gunfire strikes against the enemy in North Vietnam. In April 1972, while acting as a task unit commander, OKLAHOMA CITY planned and led many daring strikes against enemy stowage areas, supply routes, and enemy emplacements in North Vietnam. These strikes were executed with a high degree of professionalism in the face of intense hostile fire from shore batteries and the constant threat of enemy aircraft. By their courage, perseverance, and dedication, the officers and men of USS OKLAHOMA CITY reflected great credit upon themselves, their ship, and the United States Naval Service. Captain Ripley received the Navy Cross for bravery at the Dong Ha bridge. Three days later our ship arrived on the scene, and our 6 inch guns helped to destroy the invading troops and tanks marooned on the north side of the Cua Viet river. Death is a part of life, and as you get older and wiser, you come to accept, if not understand that. Death makes new life possible. Without death, life wouldn’t really have much meaning. The world, and even existence in the larger logical sense is a serious and frightening place, and our actions all have consequences, it isn’t a game or a joke or a fun place for endless frivolity and do-overs, but it’s not a terrible place either. There’s a line between good and evil we all have to walk. God may have provided a context, but man is ultimately responsible for his fate. Cancer kills, but who knows what harmful man-made chemicals cause cancer, or through whose neglect they came about? Earthquakes kill, and floods inundate, but we choose where to build. Birth defects and still births seem to be no one’s fault, least of all the one who suffers, but they too have real but unknown root causes. No man created the world, that I know. I prefer to believe that a loving and beneficent God created it, a wonderful and beautiful earth where life can thrive amid chaos, if only at great cost and great sacrifice. I also believe God made the ultimate sacrifice for us, giving up his earth-born son, Jesus to give us hope, to make eternal life possible, but He couldn’t come until we/humanity were ready to receive His word and He’s perhaps even risking it all for us. But that’s the way God rolls.